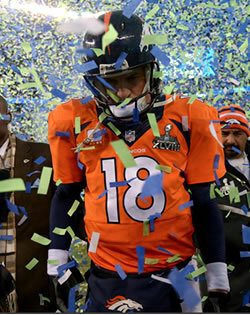 Those of you who watched Super Bowl XLVIII were probably treated to one of three experiences. If you are a Seattle Seahawks fan, you experienced the ultimate joy; a dominating Super Bowl win that proves your team’s legitimacy and leaves you dreaming about a possible dynasty. If you’re a Denver Broncos fan, you were left with the terrible taste of feeling like your team didn’t show up for the big game (Giants fans know this feeling from Super Bowl XXXV against the Ravens, Patriots fans know it from every year for the last 10 years hyooooo). If you were like me, a fan of neither team just looking to watch a good game, you were left with a lot of “geez” feelings every time Seattle scored and some excitement in anticipation of how Seattle would score next, but most of all you were probably a little bored. There’s something about the type of performance Seattle put on that is kind of exciting, but I was definitely a little bored at times (Dr. Draft, his lady, my lady and I ended up playing Cards Against Humanity towards the end). My biggest feeling throughout the game, however, was relief. Why relief? Because Eli Manning still gets bragging rights at Thanksgiving and Christmas. That’s right, Eli has more Super Bowl rings than Peyton. Peyton has also now lost two Super Bowls, which is a little more icing on the Eli cake. Look, no one’s ever going to say that Eli is a better Quarterback than Peyton because he has more rings. There are some pretty bad QBs with Super Bowl rings out there (looking at you, Trent Dilfer). Sure, Eli is already, statistically, the best QB in Giants history. He has the most yards, TDs, completions and attempts (yes, INTs too); and he’s also got the best completion percentage if you don’t count Kurt Warner‘s 3/4 season at the helm. Peyton, however is probably gonna have most of those too, but for the whole NFL. He needs just 6,975 yards and 18 TDs to pass Brett Favre for the all-time lead in those, the two most important QB stats categories. Considering Peyton missed all of the 2011 season, I think it’s a safe bet to say that he’s the best QB of all time, let alone in the Manning family. He doesn’t need to also have the most Super Bowl rings in the family too. not that it matters. i’d rather have you read it and disagree than not read it at all. some day… thanks for reading though. really do appreciate it. do you write at all?